The pony at the reception desk was busy polishing her hooves. She’d occasionally glance up to see how the world would be fairing around her. And for every new guess, she’d gesture them to one of the nearby chairs after handing them a number. But what could possibly be going on inside the lab? Not a single person has been served just yet. And surely with the event being set up well in advanced, the lab should already be prepped? Well… for those who don’t know the mechanized engineer all too well… you’re in for quite the treat. Inside this very laboratory there were engineers and scientist all scrambling about as a testing was about to commence. Many of which quickly ran for the safety of the observation area. And there were a few interns watching this with quite a large amount of confusion! “Mister Fractal! This can’t possibly be safe! You saw the charts! There’s a large amount of energy in that crystal! And we don’t even know where it’s from,” whined one of the interns, who would likely have a better result in whining to a wall that it should stop being a wall. There was a moment of hesitation, and finally a nod. Well… the worst came. As now the alarm lights inside the laboratory were flashing red and blue. A very simple code for “Things are all bucked up now, please panic.” Inside the testing chamber, angry, acidic green rift through time and space had torn open and was blasting the room with radiation and lighting. Many of the high durability safety glass had been ripped apart and sucked into the growing vortx, while it continued to destroy the room and the very foundations of physics! Machina who was holding on for dear life to an Eclipse Aerospace Laboratory Courtesy Bracing Pole told the harrowing tale of the events in his own words. Let us listen closely now. That angry rift was not amused. Nor did it care for Machina’s ramblings as it grew in both energy and sign. Until finally… it ‘popped’. What ever glass was not destroyed yet had been destroyed. Multiple heavy steel platings on the wall had been ripped off and flung everywhere. And the entire lab had been bathed in a blinding ray of light. For those outside of the lab, they’d feel the ground shake violently before the power went out. A few seconds later… the whirling sounds of fans in the vents kicked on. It was a simple metaphorical voice that proclaimed “let their be lights” and so there was. Parallel universes, be them the same or different show up often in films, Books and Comics. An easy get around to make a new world for such settings and the dangers in them. But for many they are nothing more than that. Stories. Or were they? Bravo glances at his HUD, the news updating with text along with sound. He hums as he looks at a dark stairway going down to the buildings basement. “Alfa, affirmative. Searching for priority 1 in basement. All units not engaging marks proceed to designated checkpoints.” He watched the text flow as all his team fire back an affirmative to his orders. With them moving he walks down the steps of the ancient buildings. He can hear a thunderstorm outside. Bad one, the building was shaking from the thunder. He just hoped the old thing did not fall down on his head. Down in the basement he found a lab, most of it broken with age or looting. To think 160 years ago this may have been some hard working front in the war. Full of ponies in lab coats talking about how the war will be over by winter, even if that failed to happen the first fifty or so times. But now it was home to nothing but ghosts of the past and his mark. An old pegasus, hiding behind some old lab gear. A runner. A traitor. Running away to help the mud walkers without thinking one moment about how his betraying of his home in the sky hurts all his race. It was disgusting. The Grand Pegasus Enclave had no room for traitors of state, home and race. “I will say this one time as I must. Given up, drop the weppen and come out slow… We will take you back and you will face justice in a fair court.” Bravo says over his power armors speakers. He knew what was going to come. No pony ever came back with him, they all know what fate was above the shield for traitors. Most wanted to go out their way, thare terms. And so when first shots of plasma were sent his way Bravo was already diving for cover. “It’s all the same with you traitors!” He shouts over the sound of hissing plasma as shots fly overhead melting the wall where they hit. The old fool did not brother to speak back. Smart pony, he know it was pointless. Bravo dashes in behind the next wall of cover. One good shot from his rifle and this show will be done. One sh- his line of thinking comes to a stop as a plasma grenade rolls up next to him. “OH BUCK ME!” He screams leaping away from it… and head long in to something else. The magic energy weapons fire started up something in the lab. Some raging vortex of power that ripped the air in front of bravo open like a broken window. A hail storm of jump smashed against him, bouncing off his power armor like rain as he flapped his wings trying to change the path of his leap. But it was to late. His HUD went nuts, flickering and bugging out he passed the broken space and flies out in to another room and face first in to some mud pony. For a moment he felt like he has seen this pony before but he did not have much time to think about that before the two got to meet face to face at speed! The gateway to his home shut behind him. In one leap he did just what many a comic book loved to do. One universes to another with a face full of nerd pony on the other end. "ow." Shifter wandered over to where Shifter had been told to go, the young hero always willing to follow the orders and directions of those who seemed to have a firm and unyielding grasp of their powers and life. Shifter knew that this was not the case always. Shifter was an example. The depth and width of the powers involved were unknown even to Shifter, and that was just the stuff that Shifter felt comfortable talking about. Unknown to most, not all, was that Shifter's personal identity crisis was deep and foreboding. Indeed, it was true. Valen Orange had been molecularly torn apart; Shifter, despite having all of the upbringing and life of that colt, couldn't even become Valen. 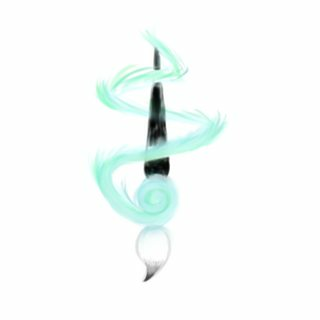 Ad Gilded Lilly, the form Shifter took? A filly who had died helping Valen make his final escape. Shifter was everypony, everycreature, everything. Shifter felt like nopony, nocreature, nothing. Shifter shook Shifter's head, almost letting the ticket drop out of Shifter's mouth. Had to focus! Shifter wasn't sure that any equipment was really needed for the type of power Shifter used, but wasn't going to say no to anything those in the know chose to give Shifter. It was guaranteed to be of some help and any young hero was taught at the academy to rely on their intelligence as much as their powers, to defer when they didn't know and others might, and to question when there was a mystery. All of these were probably good lessons. Shifter had certainly taken them all to heart in lieu of true answers to many deep questions. Could Shifter have known what was going to be given to the young hero that day? Perhaps if more thought had been given to it, yes. But Shifter's mind was rarely brought to the material around Shifter unless there was a pony in need of saving. Shifter handed over the ticket and took Shifter's seat, whistling gently. It wasn't long before something unusual happened. Loud sounds, explosions, the sounds of chaos, and finally a small earthquake. This last one caused Shifter to jump up and transform into one of the kindly janitor ponies, a pegasus. Shifter didn't like this and considered running to get help, but the general ease of the ponies around Shifter allowed some calm to settle in. After a few more seconds, it said...well, ready to serve. Shifter wasn't going to question it. Heroes could be strange. Shifter hovered over to the door and knocked, changing back to Gilded Lilly- the Janitor's thoughts of feeling powerless amongst all the Empowered were a bit too sad for the moment.
.:: Deep In Machina's Mind::. Machina was ‘conscious’ so to speak. Well, it was more accurate to say that he was technically unconscious as he was unresponsive, and burried under a pile of rubble and scuttled machinery. But he was conscious in a different sense. Instead of seeing the world as it was, he saw a world of artificial black. His body was no longer a combination of cybernetic implants, prosthetics, and organic pony parts.. But in this world.. He was completely organic. Like his accident never happened. The ground he stood up was dully lit up by some unseen night source. And there were multiple screens around him displaying error messages and system diagnosis. And just a small ways before him, was a orange female sphinx created by thousands of tiny holographic cubes that grew and shrank in accordance to her movements and an invisible grid. She was casually looking through a ‘window’ that was displaying live footage of the Lab wreckage. “Welcome Back to 'Hello World'’, Voronoi.” The sphinx drawled lazily. Her paws digits began to tap quickly at a keyboard starting up a reboot function. To that, ARID’s gaze tore away from the monitor to gaze around with a bored look in her eyes. “I apologize, Voronoi. I know you enjoy your fantasy world and games. However, I am unable to interface with the remote device responsible for the simulation. I suspect it got damaged. We are currently in my preprogrammed response to null-resources. The sharp tang of soap filled the air as thousands of bubbles began to erupt from the ground. Many of them were small. But a few were large and durable enough to lift a pony into the air. The stallion, as incredible of a mind he had, a mind that had forged himself a legacy in a matter of a few years… had reduced it’s self to the mental aptitude of a hyper active foal. He danced, leaped, lunged, and flailed in joy. His mad giggles echoed through that empty space for an eternity, forever to haunt the bubble filled mind of a flighty professor.
.:: The Waking World ::. The lab’s testing chamber was in ruins. Broken glass laid everywhere. Expensive looking machinery had been twisted, warped, melted, and outright ripped apart and thrown about like conffeti. And in some areas, the concrete and steel walls looked like swiss cheese as objects had been thrown through them at high speeds. Beside pony that was a new arrival to the universe was a rumbling in the rubble. Slabs of stone lifted and fell off a pile as Machina rose from his metaphorical tomb. His head turned one way with the whine of gyros in his neck. Clicked, and turned another way. One leg rose up, planted it’s self firmly on a large rock, and the next came to pull the pony out. If the robotic movements did not show signs of anything being wrong, than the unresponsive and dialated eyes certainly did. “Please stand by. Machina is currently indisposed. His cybernetic implants had desynchronized with his nervous system, causing him to lose control of his own body, send a surge into said nervous system, and forced him to enter a temporary coma. I am awaking him as we speak.” ARID’s voice echoed over the intercom. Despite the cold mechanical tone of it, it somehow managed to display warmth and concern. The air returned to silence for a mere moment. Something broke the silence. It started low, and quickly grew into a higher pitch. Just when it became unbearable, the pony’s body spasmed as arcs of lightning jutted from his body and licked along nearby metal surfaces. The pony fell to the ground, and began to thrash violently. His eyes loooked around frantically as his limbs scraped and tossed at the rubble. “OH SWEET CELESTIA! MY LEGS! I CAN’T FEEL MY LEGS! WHERE ARE MY LEGS!” The pony cried out, unable to recognize his own mechanical limbs. Bravo hated being in PPA well it was offline. It was claustrophobic, dark and all sound was muffled. Worse of all he was trapped in it as the emergency release was found just behind his neck and between his shoulder blades… And just out of reach of his wings and hoofs. So it was to no small amount of joy he saw his HUD flash it’s boot up and start showing emergency data. Whatever just happened it shocked most of his gear pretty bad, all of it had to be restarted and his MSB was overheating something nasty. So the first thing to be done was fix that. About mid back the spin plates open with a hiss before a blast of steam and scorching hot air vented out around the glowing rod shaped core in the back, the heat was so heavy it made the air shimmer and wave. As that cooled off more of his gear was coming back online. First he can see, there was not much too look at. Trash. Rubble. Some pony was standing in front of him maybe. Than sound, he wish that came last as his ears were hit with somepony screaming about their legs. Next was the ta- “SWEET LUNA BUCK ME WITH HER BACK HOOVES!” Bravo screams in his helmet as the nerves in his real tail got forced back in to guiding his PPA scorpion tail. If this was a slow power up it takes a few minutes and feels numb. Do it fast? Well it felt like dozens of red hot drills in ones rump. But for everypony in the room it was just muffled screaming to go along with Machina’s less muffled sound. After the pain dies down and Bravo stopped seeing stars he looks back at the checklist. Almost done. Voice. Legs. AFS and so onj cheek off as green. Well it felt like a long time he knew it was only a few short moments long. Pushing up off the floor he stands, shaking off dust as he looks about than at the pony he crashed in to. That was not the doctor, the lab did not look the same at all and his map was going nuts. All in all a chain of very distressing details and honestly he had no clue what to do with this. So he just screamed at Machina. “WHERE AM I AND WHAT IS GOING ON!? SPEAK UP MUD WALKER! WHAT I-” He stopped as his map dinged and updated. He was in Canterlot. “What.” He says to himself in utter confusion. Canterlot was a dead zone! Unfit for life! Even in PPA one will die in just moments! Yet he was alive and so were two mud walkers open to the air. “THE BUCK IS THIS! ?” He shouted at Machina as if the poor mud walker will even know what he was asking about now. Shifter saw a great deal in a short amount of time. It was clear that Shifter had never really seen the sort of technology on display outside of The Institute. It brought no small amount of pain back to Shifter, but alas, such was the lot of life given to the would-be superhero. All such technology only ever seemed to cause pain and sorrow no matter the intent. Even here, during what was meant to be a simple and easy day where heroes and heroines got gear from one of the brightest minds in the field, something went wrong. Drastically wrong it appeared and in no small part due to some manner of malfunction. Another reason why Shifter was happy that Shifter wasn't a technology dependent heroine. Wasn't that Shifter immediately distrusted any and all pieces of it- Shifter was far from some Luddite- but it only too a few painful turns of the wheel for anypony to fear the prospects of failure that came with it. Shifter had seen that wheel turn harshly. One of the cameras told Shifter to go back to the foyer. Shifter was also called a mud walker. What was a mud walker? It didn't seem to make much sense. Was that some sort of slur? Shifter's mind ran a bit with the confusion but centered itself upon the knowledge that it didn't much matter. Machina was hurt but...recovering, Shifter supposed. This new fellow was undeniably stranger. The armor had this unusual mix of crude markings and poor workmanship compared to what Shifter had scene coupled with unusually advanced technology. It was also uniquely built for a Pegasus. The user appeared...angry and no small part confused. He even picked up Machina and yelled at the poor stallion, who in turn had just been screaming about his legs. Was he suffering from some sort of momentary memory loss due to the accident? The whole situation was beyond unusual, and no small part of Shifter thought well of the system's advice. Turning back would be...safer. Machina was completely incoherent. Despite being picked up, and thrashing his mechanical limbs against the suit with loud clanks, he did not seem to be able to see the pony in the power suit. Much less hear him. No, his pupils were like pin pricks gazing into a distant memory. They saw the past as it was, back when he and his cousins were quite competitive. Always competing to one up each other in technology, till Machina had gone a little far and ruined his body. But slowly, things began to fade and merge together. Bloody little stubs in his eyes had been swapped out for powder coated metal legs. He eventually calmed down. His screaming reduced to ragged pants. There was a soft click, just before the hooves flared it’s chassy into four extensions extensions. The extensions unfolded with gentle clacks into griffon like digits that flexed as the pony moved them. It took a moment, but the pony was eventually able to feel the artificial sensations from them. Not quite like a real limb that can feel heat. But well enough to not crush something by grabbing hold of it. “Uwhaa,” The brown stallion drawled out when he heard someone call his name. He glanced down to his side to spot a pony among the ruckage. He was about to say something. But there was a pause. Why did she look so concern? “Ah! Hello...er…” his eyes darted to the side for a moment, observing a floating text that only he could see through his eyes. “Shifter! Thank you for the reminder! And sorry for the mess! There was a bit of a catastrophic failure! 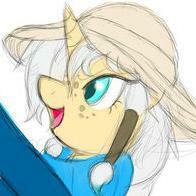 We were experimenting with a new way to create toast you see!” The pony chirpped with a broad grin. The pony sighed as he turned to make his exit through the chamber’s door. Not that it mattered that he used the door… as there were plenty of holes in the wall. But he did not make it far. No, his nose bonked into something solid, metal solid. His eyes rolled up momentairly to see a rather dirty looking form fitting exoskeleton on a pegasus. Being confused was maybe to gentle a word for how Bravo was feeling. But the pony he was shaking about to make talk was being useless. Lots of screaming but not about what he needed. But that face was… Was this pony related to somepony he knew? Well, that is something for latte. Letting the useless pony go he looked at the new face that was talking to him. Some small mud walker, a young filly? At least she was talking and useful. His map updated with ‘?Academy of Heroes in Canterlot?’ for where he was now. Odd name, it was nowhere on his map data. After calming himself down to not spook the filly he was about to ask more when the augmented pony stopped screaming so much… And talked. A lot. About nothing useful. Blah, blah, blah none of that told him much. Seems like this pony was on one to many drugs. Than the augmented walked in to him and acted shocked. How did he not see him!? That alone left him more confused as the odd pony looked him over and went off about his kit. At first he was confused as too how he’d even know what it was but well… this pony was augmented. He may be insane but he must be smart. Recovering from far to much going on Bravo takes a few deep breaths. 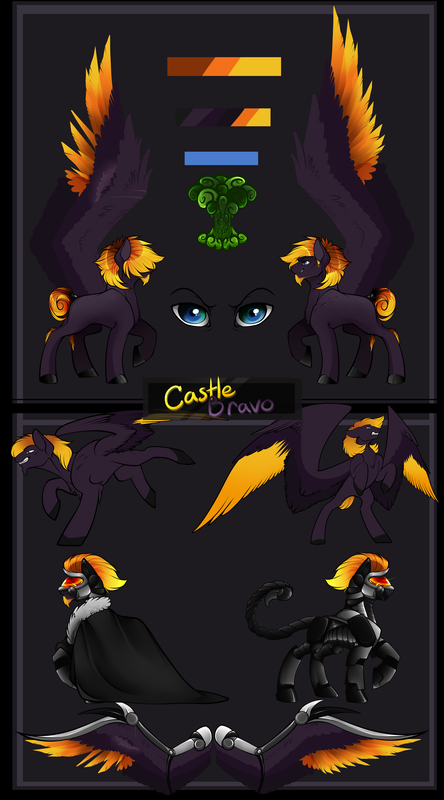 “I am Castle Bravo from the Grand Pegasus Enclave. I demand you inform me as to where I am in detail or face punishment for holding a citizen and soldier of the Enclave.” He spoke in a strong demanding tone as he eyes the two strangers up. “And how I got here as as if you are helping that mud loving trash I was hunting, you will be charged for hiding enemies of the Enclave.” his scorpion tail flicked at Machina. “And… Do you have a brother? Gadget?” He asked. But then again, wasn't it the business of villains to do unexpected and dastardly things? It was just sheer dumb luck that her opportunity ended up coming when the lab was open to the public. This was both good and bad, as confusion would be multiplied by the number of ponies present, but also the risk of being stopped by some pesky heroics. But, she had only seen one neophyte from the academy go in, so she supposed that now was as good a time as any. "Ready girls?" She whispered hoarsely to concealed hechmares in the neighboring building. "We're moving in. Don't forget to sweep the perimeter clean of all crystal shards to take home now!" She gave a slight giggle as she led the way. Considering how her henchmares always dressed, she'd made a pretty good pun! The first indication to the ponies in the lab that something further was about to go wrong was a deep, guttural rumbling within the plumbing of the building. The rip through space and time that had been triggered within the lab had obviously not been kind to the structural integrity of the pipes, leaving them vulnerable to elemental manipulation. With an ominous gurgle, the leakage from already broken or ruptured piping momentarily ceased, before suddenly gushing forth in a slightly saline surge that splashed like the waves of a mighty sea! It was one of the deep, unwritten laws of this universe that supervillains would never approach sneakily when they could make... an Entrance. And Platinum Gem had done exactly that bursting through the door, while simultaneously sending a magical ripple through the flooding to part the waters for her to walk through undampened, which she did with aplomb! With golden mane, alabaster coat, and a jewel-bedecked figure of which it was rumored that the great Solar hero herself was jealous, the mare was an undoubtedly enchanting sight. Let's just not mention the fact that these looks were almost entirely due to one of her signature relics, shall we? Shifter was interrupted by the bursting of pipes. Out of reflex, Shifter turned into a pegasus colt and allowed the waters to wash down below as Platinum Gem made her appearance. It was true what the Threat Analysis had said about the mare. She was certainly beautiful. Shifter was a little too young to really be too caught off guard while the fact Shifter changed body types and chemistry made Shifter more immune to such charms, but that didn't mean Shifter couldn't appreciate the beauty. Beauty or not though they needed to focus on keeping this place safe, She was a villain, after all. This would be one of Shifter's first fights in a...while. Shifter transformed rapidly into one of the security ponies that the Academy employed, a large stallion in a dark blue security uniform. The Grand Pegasus Enclave…. what in the hay was that? The first sign of the stallion’s confusion was his metal talons extending once he raised a hoof to give the back of his head a few scratches. He slowly shook his head with pursed lips and took a few steps back to get a better look at the stallion in whole. “I don’t know a Grand Pegasus Enclave… and I don’t have a brother named Gadget… I have a sister. But it’s not something you’d realize by looking at us both,” The stallion nickered. His gaze turned to Shifter while wearing a broad grin. “But you’ve not lived till you have tried toast cooked in an unorthodoxed way! But yes… I do believe you’re onto something…” The stallion hummed. Several holographic rings appeared near the pony’s temples, projected from small hardlight projectors hidden within the patch of synthetic skin on his neck. A moment later, and a full visor formed and looped around the pony’s eyes. The visor flashed through multiple colors as the pony began to rotate the rings with a talon. “X-ray… no. Thermal… no. Erm… echo visor… no. Blacklight… no. Infrared… no. Ah here we are, the scan visor~” The mechanized stallion chimed. With a quick tap of a holographic ‘button’ in the middle of those rings, the visor flashed green and then blue as it locked onto Bravo. At the bottom of the visor visible from both sides, one could see a tiny progress bar roll from one side of the screen to the next. Meanwhile multiple windows appear around the stallion’s eyes. Each window depicted some curious information, or an exploded view of the suit as a whole. More importantly, once it finished a single window appeared in front of Machina’s eyes with the final results. The pony’s thoughts were cut short. The many hardlight projectors hidden in the synthetic patches of his skin quick flared into activity. Rounded, blue-green, translucent plates of light quickly formed a few inches from his body and rounded over to protect the organic portions of his body, and eventually bleed over into the mechanized bits. It was not his typical armor, but in a pinch it served its purpose, provided the pony doesn’t take too many harsh hits. His visor flashed red with the words “WARNING: HOSTILE ACTIVITY IMMINENT” written across the screen. There was a brief but thunderous roar that took to the air when the stallion’s prosthetic legs opened up around the hooves. A quick, discharge of tremendous energy sent Machina hurdling backwards through the air towards a nearby wall. He struck it hard, and allowed his tallons to cruch the concrete for a purchase in three legs, while the other was outstreatched. Several vents had been exposed, pumping out heat while a ball of energy grew in it’s talons. The pony was ready to fire it towards the attacker. But once he heard the voice, the ball disappeared. “Platinum Gem? Well I’ll be! Stand down everyone! She’s welcome here. A friend! With benefits really! We were once in the same bedroom, and here we are in the same lab. Long story,” The stallion laughed at his own crude joke. Wheter there was some truth in the benefits bit is unknown. It is a crazy, caffeine addicted scientist we're talking about here. The filly was to no shock, not useful. But they seem innocent so that alone was a gift to see from a young one. The real useful one was the mud walker named Machina, cleary insane but there was some real smarts in that head. Shame it must be cooked out on drugs. But the show of tech keeped on going as he… did something. Scan visor? Bravo arched his eyebrow, out of view behind his helmet but he was very intrigued and confused as the screens… popped up. How did they do that? Magic? He was not a unicorn. It must be teck and that was very alarming. Mud walkers can not be allowed to have something like this. And soon as he opened his muzzle things got wet. Grand. A lot of things happened very fast, for all of it Bravo did not move as he just watched the unfolding drama as he shakes his giant wings, than opens them out. He’s never meet one pegasus yet with wings close to his. “You got my wings wet.” He mutters over the speaker in his helmet as he looked at the new face… By the sisters… He was glad he was already stretching his wings out. Platinum was her name? “You are the best looking mud walker I have ever seen in this hell hole.” He says with a fant sinker, the rest of the room being blown off now as he zoned in on this pretty mare. She was a friend… with benefits? Well, maybe it’s time to switch gears and make friends with some mud walkers. “Are you from a Stable? At the least the parents? Don’t see no pip-buck on you… But you look more beautiful than the pinup mares in postcards.” He added to help put a better hoof first. Whatever was up with this mare… she put even put Air Raid to shame and was not an easy bar to jump over. "What does it look like I'm doing? I'm here to clean up, and clean out!" She giggled, her laughter reminding one of the faint chimes of golden bells. It wasn't even spoiled by Machina's crude attempt at humor, though she did roll her eyes. "Benefits, pah. You hardly give enough of those to your janitors, with what they have to deal with!" Whether an old friend, or an old rival, it was clear these two knew each other well enough to banter. "Leaving all these valuable things in a pile for anypony to pick up, I mean really. High time somepony taught you to clean up your messes! We'll just help ourselves to the tuition fee, hm?" Whatever the pay package the lab's cleaners were given, it was no secret that Platinum paid her own maids well, base salary as well as hazard pay, with insurance to boot. You really had to shell out to get good help these days; many villains found themselves defeated not by any dashing heroics, but by prosaic bankruptcy. Crime, after all, doesn't always pay. And then, of course, there was the third mysterious interloper. Oh, he looked the crude type, no doubt; one hardly ever heard such a phrase as 'mud walker' in these enlightened times, even from the most jingoistic unreconstructed old pegasi. But Platinum couldn't deny, there was something about rough strength that she innately admired, along with a fine pair of wings... "Hm, well, I'd say the same for you, flyboy, but alas, I don't have x-ray vision." She dropped her voice to a low purr, the kind that ran like a leitmotif through the fantasies of every soldier in every age. "So why don't you lay aside the heavy metal and let me get a good look, hm?" This form belonged to one Sterling Silver, and he was very much a stallion. Normally quite affected by somepony like Platinun Gem. Normally more than a little cowed. Indeed, momentarily Shifter had to corral the thoughts that ran through the mind. Only a moment and this wasn't a normal stallion. Shifter had complete control. Perhaps Shifter's allies were not as reliable as one could hope. Machina, the scientist, was terribly indisposed with her beauty. They had a past that wasn't fit for a young mind to stay long on. Or maybe it was just playful banter. Shifter wasn't sure if playful banter was much warranted when the Academy itself had been breached. Shifter hoped it was all a plan to ensure that Platinum was caught off guard. Machina was, for all his craziness, a hero. Shifter was more concerned about Castle Bravo. He was still throwing around terms Shifter didn't understand but was more completely smitten by Platinum Gem than anypony else. Hmm. And he seemed so serious, too. And Platinum had even stated what she was here for! Sweet Sisters, talk about a beauty overkill. Shifter thanked the stars, for the first time, that the powers Shifter had dulled or perhaps prevented such an animalistic reaction. In any case, they appeared to be momentarily useless. Charmed. The sound of the Maids rummaging took Shifter's attention away from the unusual arrangement in the main chamber. “Sisters above, I'll do it,” Shifter muttered to nopony in particular as the security stallion ran to confront one of the maids, all of whom were outside of the main chamber. The stallion galloped quickly, coming to a stop just inside one of the side rooms where he found a maid going through the area, looking for Crystals. Good. Good, only one here. “Ma'am, you need to cease your activity and come with me,” Shifter said in the best security voice that could be mustered, drawing close to the maid in a battle stance. Shifter looked around, trying to formulate a plan for what to do with the maid if the plan worked. First, get close. Maybe it would be easy and the maid would be subdued? No doubt she wouldn't allow that to happen, but that was fine. Shifter had many bodies that could be used for this fight. As long as Shifter was able to get skin-on-skin at some point, the real victory would be won. Machina clicked his tongue as he rose a mechanical claw up to his temples. With a small tap, the hardlight visor faded into nothing. He allowed that same claw to casually drop and hang uselessly while he regarded the invading Mare. The stallion began to crack up when she revealed her intentions. And further also revealing that she was at least smart enough to not go after something as dangerous as energized crystals on her own. “Oh? Careful now, love. Them’s some fighting words you’re blowing out with hot breath. And you and I both know I don’t play around in fights~,” The stallion laughed. His claws began to clench down on the stone, squeezing harder and harder till finally they crushed portions of the concrete wall and completely dislodged the cyber pony. He fell to the ground, landing on his feet with a solid ‘THUNK’. “I’ll have you know that we proudly do not have Janitors! Well… less proudly… and more on the lines of none of them have a security clearance…” the stallion then muttered something about also having some real rotten insurance. Damned “heroic” insurance is a scam… and the only plan available to him. Never mind that it barely covers anything. He shook his head slowly and plucked up a nearby potted plant. The poor thing had been knocked over, yet surprisingly it remained green, vibrant, and relatively unharmed. He looked up to one of the shattered windows in the observation chamber, and concluded that it probably got sucked in. His gaze turned to Bravo… who was in the meantime… was kicking his Mac Daddy to full drive. Bravo was having a hard time caring much about what was going on, his HUD was showing no danger marks and so far, everyone here seemed harmless and useless. Well maybe not Machina, he did seem to be on drugs. Or something. And the filly was… Where did she go? He looked about the room, but she was out of here. Most have ran off. Looking back at the mare he chuckles and taps his helmet. “Sorry, I can’t remove all of this. At least here, to risky even for a mare like you. First law of the wasteland, trust no one. But I can make do without this.” He sits down and uses both his front hooves to push in two latches on the sides of his helmet, first off was the muzzle guard. After that he pulled off the faceplate, revealing his face well his neck, ears and back of the skull stayed behind palteing. Shaking his head he grins at the mare. “Names Bravo, hunter for the Enclave and don’t believe whatever stupid buck you heard others say on the radio, we are the good ponies hear. Most of all us hunters, we keep criminals away from the wasteland!” He says with a smug grin, still not grasping the fact he was not in his home no longer. It was quite true that snatching up magical energy crystals unprotected was just a bit of a risky business. Altogether worth it, considering just how valuable these things were, but still, if the maids didn't have special containment bags on their person, the unpredictable effects alone would have been security enough. Even as it was, there were a few odd transformations occurring. Unfortunately for Shifter, this meant that by the time they went to touch one of the maids, she had already turned into a cat! Which would leave them both as two furious fighting felines, a real literal catfight! Not that Platinum knew any of this, not being gifted with second sight, or a high-tech visor that could read Machina's security cams. "Oh, silly stallion, you could have Janitors if you were just willing to pay ponies enough. Solar knows I do." The bills were... frightening, and would have been more so were it not for a few insider contacts within the insurance business. "In any case, I thank you for not making this *too* much of a hassle with any stupid heroics." The glamorous mare cast an appreciative eye on Bravo's exposed face, though the look shifted to quizzical at hearing his words. "Enclave? Wasteland?" She turned back to Machina. "Do you have any idea what handsome here's talking about?" Shifter had not expected this sort of reaction. The magical items in question no doubt had a number of properties above Shifter's pay grade and knowledge base, but Shifter hadn't really considered transformations to be something that the gems would make Shifter contend with. The young Empowered did enough of that already! The first big transformation that took place wasn't even Shifter's. That was different, at least. The maid-operative's uniform seemed to pop up as if jolted by some greater force, but the truth was simpler. She had simply shrunk. Shrunk and, more importantly, no longer a pony of any kind. A small tabby cat- well, small as in not jaguar size, pretty healthy looking for a house cat- had taken her place. Same eye colour though. A momentary look of panic and confusion, some fear, followed by a hiss and latching onto Shifter's outstretched leg did little to tell Shifter anything all that useful. “Yoww!”Shifter bellowed, half in shock, half because cats hurt regardless of who you were. Shifter shook the leg enough to dislodge the maid-cat, who went skittering on top of a counter, wantonly knocking down some roguish vials. The cat didn't shy away from wiggling itself in preparation for another attack, getting ready to pounce. And indeed, that was exactly what it did, sending itself with claws outstretched hurtling towards the security pony. Except by the time the maid-cat arrived, Shifter was no longer there. Shifter was much, much smaller- in fact, Shifter was the very same cat! The rush of a very strong, very violent feline personality was more visceral than expected. More subdued was the slowly bubbling memories and personality of the maid. Shifter needed more. More contact, more excitement, more of the maid. Luckily, the feline personality was more than happy to oblige, and Shifter was happy to engage with it. Shifter charged and impacted the maid-cat as the foe landed on the ground, Shifter utilizing this advantage to send the maid-cat flying and gaining leverage in the ensuing fight as they crashed against the wall. The maid was not used to transforming, to working with and if needs-be overcoming alternate personalities. Shifter had that experience and used it well. Shifter attacked and quickly gained superiority over the maid-cat, a whirlwind of claws and teeth in painful but less than lethal places. Both moved with lightning speed but only one of them acted with confidence. It wasn't long until one of them got the other in position for a series of bunny kicks, the other held firmly in place and unable to act. To the back of the head a rapid series of kicks was delivered, claws sheathed, in fast and rapid movements against a cabinet. Once again, Machina had that arcane-holographic video feed up and hovering just before his eyes. He sat with a face best described as bubbling suspence with a dash of thrill. Oh yes… he was very much enjoying watching the fiasco go down inside his personal stores. Where maids were panicing just as one crystal exploded, causing a mass chain reaction to occur. Ponies left and right were being transformed or teleported elsewhere. Some were quite lucky and only became cats! Those of superior genetics that clearly identifies them as one breed of horse, found themselves transformed into a notable pedigree, while other’s became the offbrand domestic shorthair. Some ponies… were transformed into potted plants that wavered and paniced like there was some unseen wind. A few very unlucky ones… were transported to the astral plain temporarily, then back screaming as they tried to run away from some unknown horror just to be transported back, and back again. The true icing on the cake to such a display of entropy that would do Discord proud, was watching shifter battle a cat. Why it was simply exciting! The mechanized pony had watched plenty of spectacles in his entire career! Super heroes fighting giant monsters, super heroes fighting super villains. But never has he saw a Super hero go toe to toe with a cat, and get her arse absolutely smashed! And oh was Machina howling and cackling like a mad stallion as he observed remotely. "You're doing great Shifter! Oh! While you are at it, please be thinking of what you'd like for me to design for you! I can't forget why you're here now," The stallion chirped happily over the lab's intercom. Though sadly, the show would have to wait. The feed disappeared just as he heard Platinum speak to himself. The stallion still coming down from his hysteria, waited till he was now at a giggle before speaking. “Oh yes… yes… he’s not from our world. Or… universe… or… timeline. Something like that?” The pony snickered a bit, "Platinum, you've put me on the spot when I barely had time to figure out what's going on!" Machina would have continued speaking, till he heard the footsteps appear in the lab once more. His eyes drifted off to the source spotting a maid… whom looked like she had gone through tartarus. But… it seems she spoke of a defeated hero. Oh dear… that simply won’t do. He was supposed to watch over the students. The stallion’s left leg opened up once more again. Various plates of the chassy pushed away from the main supporting structure and slid to the side to reveal a series of vents, both for intake and exhaust. Now in it’s energized cannon configuration, it quickly swung upwards from the ground and pointed in the direction of the unfortunate ‘maid’. Without hesitation, warning, or signs of mercy Machina fired the weapon. There was a momentary slurping sound as a bright blue corna flashed. Just as the weapon erupted a very distinct arcane discharge took to the air. A single resounding boom followed by crackles of electricity. Heat that couldn’t be contained in the heatsink supplied in his ‘ammunition’ bay was dumped out of the side. A ball of energy, appearing quite like a ball of lightning, tore through the air at speed towards the pony whom had just defeated one of his students. “Platinum, you should reeeeeally warn your maids not to do anything that would cause me concern. The students under my watch is definitely one of the things that concerns me,” The pony mumbled. He kept his cannon trained on the maid’s position. A new ball of energy charging and readying up to fire. Then... the pony paused. The ball faded as he tilted his head thoughtfully. "Wait... you know I don't get involved with villains unless they get reeeeeaaaaal dangerous. Did.... did I ever tell you the other scenarios I might get involved? I mean... I still won't feel too bad. It's set to stun... I think. I hope..." The mechanized stallion's eyes flicked to the side to glance at something that only he could see. "Ok. Good it's still stun! Been meaning to color code the blasts. Blue is a good kill color... as well as stun. So it's confusing." The doors of Machina's workshop seemed to shift and shudder for a moment until they slowly opened up to reveal... noone? There was the sound of hoofsteps clopping forward in the hallway and a faint sense of mounting unease. The first thing to come through the doorframe was the head of a white coated pony with a mane of three colors: Black, white, and violet. "Afternoon all!" Her voice was thick with a Fet Loch accent, "Wow... it looks like I've missed quite the sale! You've already got this one all suited up?" Her head moved on into the room. Only her head. If she had a body it was not visible... the disembodied head floated on over towards Bravo. "Something about you..." She narrowed her eyes at him for a moment, "...Seems to scream 'tourist'." Those hoof steps from the hallway soon entered the room proper, belonging to a headless body wearing a flowing black dress whose ends were slightly tattered and torn. One last odd trait this being had was her unusually dark shadow: Standing out with an absolute opacity with what seemed like a very faint tinge of red. "I'm called 'The Hexxer', my friends call me 'Lus'!" She would extend a hoof towards the armored stallion... well if her hoof wasn't halfway across the room. She corrected this quickly though as her body moved with an oddly ominous swish across the room, now with her foreleg extended as if expecting a shake from the armor clad pegasus. Her head floated over to Machina's side, "You're Machina, right? I have a couple things I've been wanting to ask you about all this equipping stuff." Bravo honestly was struggling to keep up with share bout of insanity before him, beautiful as the mare was she was having a hard time keeping his forces. Between the hailstorm of gibberish Machina just attacked every pony in the room with than pulling a blasted gun on some pony. So much happened it took him a few moments to even respond to it all in the only way he can. “WHAT IN THE #$r@$# IS %#$% GOING ON! ?” He screamed waving a hoof at every pony. “The Wasteland is the world, ever go outside? The name gives it away! And the Enclave is the leftovers of the government and the only real government left, all others are usurpers and liars. We ARE equestria, end of story.” He takes in a deep breath, than glares at Machina as he smacks the cannon away. “And how DARE you say I share blood to that mare! She betrayed equestria, the Enclave and the pegasus race. To even whisper a soldier of the Enclave is related to that mare is crime against the government itself and I can have you ex-” Bravo’s heated and rather angry rant at Machina ends thanks to Hexxer showing up. The arrival of the maid back into the room was not greeted with any kind of enthusiasm. In fact, Platinum received the news of triumph with a cold look of irritation. "What are you doing here? I told you to help the others once you'd grabbed the crystals, and make for the exits!" She spoke in a harsh whisper, though by now everyone was in close enough quarters that they could probably hear her anyway. Not that it would matter for much longer, the plan was wrapping up. Even if there were many crystals left behind, the maids couldn't stay exposed to the piles for much longer before they all became magically infected. Arguably, they had already exceeded the maximum exposure time, and somepony was gonna have to pay for the antidotes. As it was, the remaining unaffected maids were having to carry their transformed and/or gibbering comrades back into the tunnels. All that remained was for Platinum herself to make a getaway, but when would be the best opportunity for that? Probably not during Machina's explanation. Partly because she was genuinely curious about Bravo, and those armor-highlighted muscles only added to her interest. Secondly, Machina was still talking more or less to her; there weren't enough distracting influences about. This fact became sharply clear when her maid found herself the target of an arm-cannon aim reticle. "Now, hold on! You've been taking way too many risks here, with both your subordinates and mine! Sure the insurance cost might be high, but you could at least have invested in holding containers for those crystals of yours! And now you can't tell the difference between kill and stun at a moment's notice?" There would be strong language in the taunting 'safety inspection report' she intended to send to Machina's lab later, ooh yes. But, Platinum Gem just wouldn't be a villain if she couldn't leave with some parting words. And she wouldn't be a mare if they weren't to Bravo. "Oh, I'd love to, but I have to look after my maids; they've gotten themselves into quite a pickle! But don't worry about lodging's. Just stop by Prince Blueblood's manor! I'm sure he'd love to play host to a distinguished visitor from... what was it, the Enclave? Do tell him I sent you!" She winked, and as if on signal, another torrent of water surged forth from the broken pipes, colliding in the center of the room to create a blinding mist. And when the mists had parted... Platinum was gone. Things didn't go as well as Shifter wanted or had hoped. Memories came back somewhat slowly and hazy due to the chaotic element of the feline. Trying to understand what the plan was, what was going on, was difficult enough by itself with everything Shifter was mentally sifting through. But alas, it was not all. Shifter's intention was to get close enough to touch Platinum, but Machina's inability to act with nuance made everything just that much harder. Adding into that was Platinum being less than entirely happy. All in all it was a poor situation, though not one Shifter couldn't handle. The ball of energy that was either lethal or stun and Shifter didn't know which was what. Just before it connected, Shifter changed once more- the change being covered up by the explosion of energy around Shifter. The mists created helped as well. In a miasma of confusion- a headless pony, Bravo freaking out, Machina talking and talking and talking and talking, the explosion of energy, and the mists- it would be nearly impossible to catch the small rat that swatted around the burned and falling maid uniform. A few moments or seconds passed as the situation calmed down. Shifter felt comfortable and it was time to get back to it. Shifter, once the coast was clear, turned back into the filly. She angrily started stomping towards Machina. “Mister Machina, I had that perfectly under control! If you hadn't fired at me I could have escaped with them. As it is I only know where they came from...well, the maid who is knocked out and hidden in the other room should provide more. But harrumph! Have some more faith in me, Mister Machina,” Shifter said, tossing the crystal Shifter had recovered from the maid. Shifter then turned to Bravo, the expression aggravated and the words direct. “Mister Bravo, you're wrong. There is no Enclave, there is no Wasteland, the outside world is perfectly fine. Go out and check. I hate to be so impolite, but I have a headache from Tartarus and Celestia above is it annoying,” she said with a sigh. Machina froze when he saw the woman disappear. His jaw fell slightly ajar, now completely uncertain if he had blasted some poor pony into oblivion without them doing anything to deserve such a fate. His eyes quickly darted to the corner of his vision, checking the bioreader to see.... that the number of life signs were still the same. The buck!? Machina stood still in confusion. A small mental command forced his visor to reset to reveal.... the same exact data. The pony scratched his head slowly and turned his attention to Shifter... who was standing in the same spot as the maid pony. "Have more.... faith," The mechanized pony drawled out in growing confusion, even after his cannon had been slapped down to the ground. Finally, soemthing clicked. The name made plenty of sense. "Oh....." he began distantly. "OH! Erm! My apologies Shifter! I simply... needed... to make... things... look...real. Oh dear, I have plenty of explaining to do later" The pony coughed at the end of it and turned his attention to the new comer. He raised a brow when he saw a strange disconnect between a head and a body. "Ah! Now that is just cool!" The pony chimmed as he quickly scrambled to get a closer look at the body. He peered down to where the neck should be. "Unbelievable! The brain stem is completely cut! It shouldn't be animated, but it is!" The stallion laughed as he quickly snatched the body up and drew it closer towards the head. "My! I thought such things were impossible! But yes! As my loud and very confused power suited pony from another time has stated, you are indeed some sort of specter!" And then came the mention of dash and food at the end of Bravo's sentence. The stallion looked to the pegasus with large wings and hummed thoughtfully. "Tell you what! Before you run off on your way. How about I treat the whole lot of you to lunch while the custodians do some repairs? You'll love it! It's just right upstairs. Has a great view, great food, and definitely free! And..." The mechanized pony looked down to both Shifter and Hexxer, "That gives the two of you plenty of time to think of what you'd like to be equipped with! This is where you'll need to think very carefully... as any work orders after today will no longer be on a rushed priority, where you can expect to get it by the end of the day. It will be about a month's time... assuming normal loads." With that said the pony quickly rounded bravo and gave him a nudge to turn him towards the stairs, before heading his way up as well. "Come now! This will also be a good chance for you to prove that we're insane and the world isn't what we think it is!" The stallion paused at the door, and turned his head back to Bravo. His eyes danced over him for a moment as various windows popped up in his view, detailing information about the armaments he was carrying. "Oh! That reminds me. Feel free to step outside of that suit. And lock it. Also put the weapons on safety. I'll have the boys give it a tune up! It looks like it's in some rough shape and only jurry-rigging kept it alive." Assuming the ponies followed the partially daft mechanized one, they would find themselves steadily climbing several flights of stairs behind a chatty professor. It seems he took the time to treat this as a small tour, showing off some of the more secure areas that requires various levels of security clearances to gain entry. The laser labs, the arcane-mechanical layers, material fabrication. Etc. And then finally the staircase ended at a door. The pony casually pushed it open, blasting the group with a blinding ray of light. He continued on unphased, exiting the building to enter the rooftop courtyard of the laboratory just outside the Academy. As promised, there was a food court built into a raised section of the building holding a series of offices for the engineers and scientist. And just near the doorway he left, was a railing keeping the flightless from falling off the edge of the building while they admired the view. A brillian blue and clear sky overlooking the city of canterlot in all of it's glory. With flowing waters from the waterfalls, to nearly endless rolling green hills. From so high up in the mountains, many of the landmarks of equestria can be seen with a slight turn of the head. Ponyville, Manehatten, Fillidelphia, and Clouds dale. Bravo was pretty taken back watching the mare just… go away like that. Rude, but pretty cool and she did invite him over to a friend it seems. So with a snort he keeps on walking away until Machina rushed over to shove him to some staircase. Outside? Free food? Screams trap, but it seemed honest and upfront far as Bravo can tell. “Fine. But I am not leaving my gear or getting out, you don’t seem to grasp I am not going to let you play with this. They’d kill me if I let a mud walker poke about in are gear.” He says heading to the steps and following them up, shooting some looks over at Shifter and Hexxer. Well they can’t see his face or eyes, both can tell he was giving them some very judging looks of disgust. But the cold air he gave off passed soon as he was outside. Bravo locked up, staring out the door as every pony passed him. Without uttering a word he slowly creeps outside, his hoof steps gentle and worried as he looked up at the clear blue sky… After looking at it, uncaring to what others around him did he removed his helmet and let his mane drop free as his blue eyes stare into the blue sky, the sun kissing his purple fur. He sniffed the air as if he walked into some restaurant as he drops his helmet and walked to some grass. Leaning down he gently rubs his nose on it. “Real…” He mutters in a whisper. “This. This is real.” The words sounded as if he can’t believe it himself.